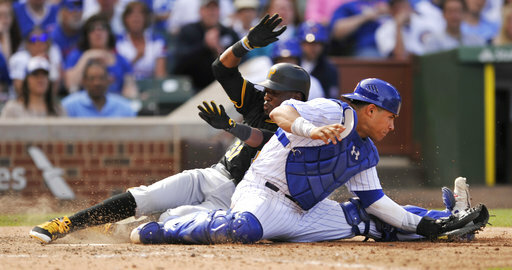 CHICAGO (AP) — For the first time in a while, the Pittsbrugh Pirates enjoyed their visit to Wrigley Field. “We came in struggling. It was big for us to get these three wins,” Frazier said. The Pirates scored three times in the eighth off Koji Uehara (0-1), getting the go-ahead run when pinch runner Alec Hanson slid home on Andrew McCutchen’s bases-loaded grounder — a replay review upheld the call that catcher Willson Contreras was barely off the plate when he caught first baseman Anthony Rizzo’s throw on an attempted force play. “That’s been more of our problem than anything, not getting a clutch hit and holding a lead at the end of the game,” Cubs manager Joe Maddon said. Tommy La Stella’s pinch-hit double off Frazier’s glove in left field put the Cubs ahead in the seventh. Chicago loaded the bases on a walk before Taillon got Rizzo to pop out to end the inning. The Pirates entered the series having lost four straight. Pittsburgh has either swept or been swept in every series this season. “They’re probably the best competition in our division, and they proved it this last series,” Cubs right fielder Ben Zobrist said. The Cubs were swept in a three-game series just once last season: June 20-22 by the Cardinals. The Cubs have blown a save opportunity in three consecutive games for the first time since May 2000 against the Brewers. Chicago relievers allowed 12 runs and three home runs in 9 1/3 innings versus the Pirates. “We just have to do a better job at the end of the game protecting leads. That’s all,” Maddon said. Pirates: OF Gregory Polanco (right groin discomfort) was scratched from Saturday’s lineup and was held out again Sunday. “I believe he needs another day,” Hurdle said. Frazier started in his place. Cubs: Maddon said he had no update on RHP Carl Edwards Jr., who went on the bereavement list Friday. Pirates: RHP Ivan Nova (1-1, 2.25 ERA) will start against the Cardinals and RHP Lance Lynn (0-1, 5.23) to begin a three-game series Monday in St. Louis. Cubs: RHP John Lackey (1-1, 3.00) is set to begin a three-game series against the Brewers and RHP Chase Anderson (1-0, 0.69).